محمدی راد, سید علیرضا, مدرس, امیر. (1396). ارزیابی دوام بتن‌غلتکی حاوی خاکستر پسماند زغال‌سنگ و فاقد افزودنی هوازا در برابر اثرات مخرب نمک‌های یخ‌زُدا. پژوهشنامه حمل و نقل, 14(4), 147-164. سید علیرضا محمدی راد; امیر مدرس. "ارزیابی دوام بتن‌غلتکی حاوی خاکستر پسماند زغال‌سنگ و فاقد افزودنی هوازا در برابر اثرات مخرب نمک‌های یخ‌زُدا". پژوهشنامه حمل و نقل, 14, 4, 1396, 147-164. 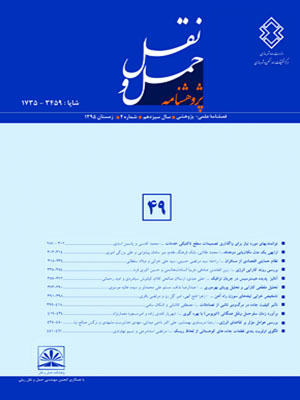 محمدی راد, سید علیرضا, مدرس, امیر. (1396). 'ارزیابی دوام بتن‌غلتکی حاوی خاکستر پسماند زغال‌سنگ و فاقد افزودنی هوازا در برابر اثرات مخرب نمک‌های یخ‌زُدا', پژوهشنامه حمل و نقل, 14(4), pp. 147-164. محمدی راد, سید علیرضا, مدرس, امیر. ارزیابی دوام بتن‌غلتکی حاوی خاکستر پسماند زغال‌سنگ و فاقد افزودنی هوازا در برابر اثرات مخرب نمک‌های یخ‌زُدا. پژوهشنامه حمل و نقل, 1396; 14(4): 147-164. هدف از این پژوهش امکان­سنجی بکارگیری خاکستر پسماند زغال‌سنگ بجای بخشی از سیمان در بتن‌غلتکی روسازی راه و بررسی دوام آن در برابر تاثیر نمک‌های یخ‌زُدا می‌باشد. در این تحقیق، از 4 ترکیب مختلف برای ساخت نمونه­های بتن‌غلتکی استفاده گردید. مقدار سیمان مخلوط کنترلی فاقد خاکستر پسماند زغال‌سنگ، 14% وزن کل مصالح خشک انتخاب شد. در سایر مخلوط­ها از خاکستر پسماند زغال‌سنگ به مقدار 2، 3 و 4 درصد وزن کل مصالح خشک استفاده شد. برای ارزیابی دوام، آزمایش­های مقاومت در برابر نفوذ یون کلر، مقاومت پوسته‌شدن سطح ناشی از نمک یخ‌زُدا و مقاومت در برابر سیکل­های انجماد و ذوب در حضور محلول نمک انجام شد. مخلوط حاوی 3 و 4 درصد خاکستر پسماند به ترتیب بیشترین و کمترین مقاومت را در برابر نفوذ یون کلر از خود نشان دادند. در انتهای آزمایش پوسته شدن سطح نتایج به دست آمده از نمونه‌های حاوی 2 و 3 درصد خاکستر پسماند مشابه نمونه کنترلی بود. همچنین نتایج آزمایش مقاومت در برابر سیکل‌های انجماد-ذوب حاکی از رفتار بسیار مناسب نمونه‌های کنترلی و حاوی 2 و 3 درصد پسماند خاکستر بوده‌است. در حالی‌که نمونه حاوی 4 درصد از این ماده پس از 180 سیکل کاهش قابل توجهی در مدول الاستیسیته دینامیکی از خود نشان داد. مطابق نتایج، بکارگیری 2 و 3 درصد خاکستر پسماند زغال‌سنگ مقاومت قابل قبولی در برابر اثرات یخ‌زدگی بلند مدت و در حضور نمک یخ‌زُدا بدست می‌دهند. 1Noshirvani University of Technology, Mazandaran, Babol, Iran. and M.Sc., Student, Civil Engineering Department, Noshirvani University of Technology, Mazandaran, Babol, Iran. 2Associate Professor, Civil Engineering Department, Noshirvani University of Technology, Mazandaran, Babol, Iran. The aim of this study is feasibility of using Coal Waste Ash (CWA) as partial replacement of cement in non-air entrained Roller Compacted Concrete Pavement (RCCP) and evaluating its durability against deicing salts effect. In this research, 4 different mix designs were used to prepare RCC samples. The cement content equivalent to 14% by mass of dry materials was selected for control mixture without CWA. In other mixture, 2, 3 and 4% (by mass of dry materials) CWA was used. In order to evaluation the durability, chloride ion penetration, deicing salt surface scaling resistance and freeze-thaw resistance exposed to salt solution were performed. According to results, all mixture in this research obtained acceptable chloride ion penetration. The mixture with 3 and 4% CWA showed the highest and lowest chloride ion resistance respectively. By increasing CWA contents to amount of 3%, surface scaling exposed to salt solution in RCC samples delayed approximately 5 cycles. However, start of surface scaling in mixture containing 4 % CWA occurs in lower cycles compare to other sample. At the end of surface scaling test, weight changes in samples containing 2 or 3% CWA is almost the same as controls mixture. Up to 180 freeze-thaw cycles in presence of salt solution, ultrasonic pulse velocity in control mixture is higher compare to other sample. While, the reduction of this parameter is lowest for 3% CWA samples at the end of the freeze-thaw test. Based on ultrasonic pulse velocity during 300 freeze-thaw cycles, control, 2 and 3% CWA samples have excellent resistance. Mixture containing 4% CWA have excellent resistance during 180 freeze-thaw cycles. However its resistance decreased in continues. Relative dynamic modulus of elasticity during 300 freeze-thaw cycles is almost the same for control, 2 and 3% CWA samples. While this parameter for mixture containing 4% CWA reduced more than 40% at the end of freeze-thaw cycles. The durability factor at the end of freeze-thaw test, are satisfactory for control mixture and samples containing 2 and 3% CWA. - ACI 325.10R-95. (Reapproved 2001) (1995), “Report on Roller-Compacted Concrete Pavements”, Report by ACI Committee 325, March. high-volume fly ash roller compacted concrete designed by maximum density method”, Cem. & Conc. Com., 37, pp.259-266. - Akcil, A. and Koldas, S., (2006), “Acid Mine Drainage (AMD): causes, treatment and case studies”, J. of Clea. Pro,. 14, pp.1139-1145. - Berkowski, P. Kazberuk, M.K. (2015), “Effect of fiber on the concrete resistance to surface scaling due to cyclic freezing and thawing”, proc. Eng,. 111, pp.121-127. - Banthia, N. Piegeon, M. Marchand, J. Boisvert, J. (1992), “Permeability of Roller Compacted Concrete”, J. of Mat. Civ. Eng.,­4, pp.27-40. - Blackburn, R.R. Bauer, M.K. Amsler, E.D. Boselly, E.S. Mcelory, D.A. (2004), “Snow and Ice Control: Guidelines for Materials and Methods”, NCHRP Report 526, National Cooperative Highway Research Program, Transportation Research Board of National Academies, Washington, D.C.
- Gottlieb, B. Gilbert, S.G. Evans, L.G. (2010), “Coal Ash: The toxic threat to our health and environment”, A Report from Physicians for Social Responsibility and Earth Justice, US, Washington. D.C, September. - Heede, P.V.D. Furniere, J. Belie, N.D. (2013), “Influence of air entraining agents on deicing salt resistance and transport properties of high-volume fly ash concrete”, Cem. & Conc. Com,. 37, pp.293-303. - Hesami, S. Modarres, A. Soltaninejad, M. Madani, H. (2016), “Mechanical properties of roller compacted concrete pavement containing coal waste and limestone powder as partial replacements of cement”, Cons. & Bui. Mat,. 111, pp.625-636. - Hossain, K. and Fu, L. (2015) “Optimal Snow and Ice Control of Parking Lots and Sidewalks: A Summary Final Report”, University of WATERLOO Report, Its Lab, Department of Civil & Environmental Engineering, Ontario, Canada, January. - “Human and Ecological Risk Assessment of Coal Combustion Wastes”, (2010), “U.S. Environmental Protection Agency”, Office of Solid Waste and Emergency Response, Office of resource Conservation and Recovery, April. - Kim, J. Moon, J.H. Shim, J.W. Sim, J. Lee, H.G. Zi, G. (2014) “Durability properties of a concrete with waste glass sludge exposed to freeze-and-thaw condition and de-icing salt”, Cons. and. Bui. Mat,. 66, pp.398-402. - Liang, W.J. Tao, S.L. Min, N. (2014), “ Study on the Salt Scaling Resistance of Pavement Cement Concrete”, J. of Hig. and Trans. Res. and Dev., 8(2), pp.1-4. - Liu, Z. Hansen, W. (2016), “Freeze-thaw durability of high strength concrete under deicer salt exposure”, Cons. and Bui. Mat,. 102, pp.478-485. - Marchand, J. Pigeon, M. Bager, D. Talbot, C. (1999), “Influence of Chloride Solution Concentration on Deicer Salt Scaling Deterioration of Concrete”, ACI. Mat. J,. 96, pp.429-435. - Mehta, P.K. Monteiro, P. (2005), “Concrete: microstructure, properties, and materials” McGraw-Hill Professional, 3th Edn., New York. pp. 684. - Modarres, A. Ayar, P. (2014), “Coal waste application in recycled asphalt mixtures with bitumen emulsion”, J. of Clea. Pro,. 83, pp.263-272. - Modarres, A. Nosoudy, Y.M. (2015), “Clay stabilization using waste and lime-Technical and environmental impacts”, App. Cl. Sci,. 116-117, pp.281-288. - Modarres, A. Rahmanzadeh, M. (2014), “Application of coal waste powder as filler in hot mix asphalt”, Cons. and Bui. Mat,. 66, pp.476-483. - Modarres, A. Rahmanzadeh, M. Ayar, P. (2015), “Effect of coal powder in hot mix asphalt compared to conventional fillers: mix mechanical properties and environmental impacts”, J. of Clea. Pro,. 91, pp.262-268. - Moradzadeh, A. Ardejani, F.D. Shokri, B.J. Sarkheil, H. Osanloo, M. (2007), “A method for coal waste disposal site selection for prevention of environmental impacts”, IMWA Symposium: Water in Mining Environment, Caligari, Italy, May, pp.1-4. - Neville, A.M. (2010), “Concrete Technology”, Longman Group, 2th Edn., pp.460, UK,. - Oliver, J.G.J. Maenhout, G.J. Muntean, M. Peters, J.A.H.W. (2014), “Trends in global CO2 emissions”, PBL Netherlands Environmental Assessment Agency, Institute for Environment and Sustainability(IES) & European Commission’s Joint Research Centre (JRC), December. - Piegeon, M. Malhotra, V.M. (1995), “Frost Resistance of Roller-Compacted High-Volume Fly Ash Concrete”, J. of Mat. Civ. Eng., 7, pp.208-211. - Portland Cements Association (OCA). (2004),“Guide Specification for Construction of Roller-Compacted Concrete Pavements”, USA, Illinois, Skokie, June. - Rafieizonooz, M. Mirza, J. Salim, M.R. Hussin, M.W. Khankhaje, E. (2016), “Investigation of coal bottom ash and fly ash in concrete as replacement”, Cons. & Bui. Mat,. 116, pp.15-24. - Ramezanianpour, A.A. Nadooshan, M.J, Peydayesh, M. Ramezanianpour, A.M. (2014), “Effect of Entrained Air Voids on Salt Scaling Resistance of Concrete Containing a New Composite Cement”, J. of. Civ. Eng,. 18(1), pp.213-219. - Rao, S.K. Sravana, P. Rao, T.C. (2016), “Experimental studies in Ultrasonic Pulse Velocity of Roller Compacted Concrete Pavement Containing Fly Ash and M-Sand”, Int. J. of Pave. Res. and Tech., Article in Press. http://dx.doi.org/10.1016/j.ijprt.2016.08.003. - Sengul, O. Tasdemir, M.A. (2009), “Compressive Strength and Rapid Chloride Permeability of Concrete with Ground Fly Ash and Slag”, J. of Mat. Civ. Eng., 21, pp.494-501. - Shahhoseiny, M. Ardejani, F.D. Shafaei, S.Z. Noaparast, M. Hamidi, D. (2013), “Geochemical and Mineralogical Characterization of a Pyritic Waste Pile at Anjir Tangeh Coal Washing Plant, Zirab, Northern Iran”, Mine. Water. Environ,. 32, pp.84-96. - Sim, J. Park, C. (2011), “Compressive strength and resistance to chloride ion penetration and carbonation of recycled aggregate concrete with varying amount of fly ash and fine recycled aggregate”, Waste. Manag., 31, pp.2352-2360. - Skripkiūnas, G. Nagrockienė, D. Girskas, G. Vaičienė, M. Baranauskaitė, E. (2013), “The Cement Type Effect on Freeze-Thaw and Deicing Salt Resistance of Concrete”, Proc. Eng,. 57, pp.1045-1051. - Sun, C. Li, W. Hou, B. (2012), “Study on Frost-salt Resistance of Fly Ash Concrete”, Adv. Mat. Res,. 598, pp.432-437. - Urban, J. Kostelecká, M. Klečka, T. (2014), “Surface layer parameter of concrete in relation to deicing salt scaling resistance”, Adv. Mat. Res,. 1000, pp.298-301. - Valenza, J.J. and Scherer, G.W. (2007), “A review of salt scaling: I. Phenomenology”, Cem. Con. Res,. 37, pp.1007-1021. - Whitehurst, E.A. (1951), “Soniscope tests concrete structures”, J. of Ame. Con. Ins., 47, pp.443-444. - WON, J.P. JANG, C.I. LEE, S.W, KIM, W.Y. (2009), “Durability Performance of Roller Compacted Concrete Using Fly Ash”, Brit. Mat. Com,. 9, 161-168. - Zaheri, M. Nili, M. (2011), “Deicer salt-scaling resistance of non-air-entrained roller-compacted concrete pavements”, Cons. and Bui. Mat,. 25, pp.1671-1676.